Stunning beautiful combination on this beaded bracelet. 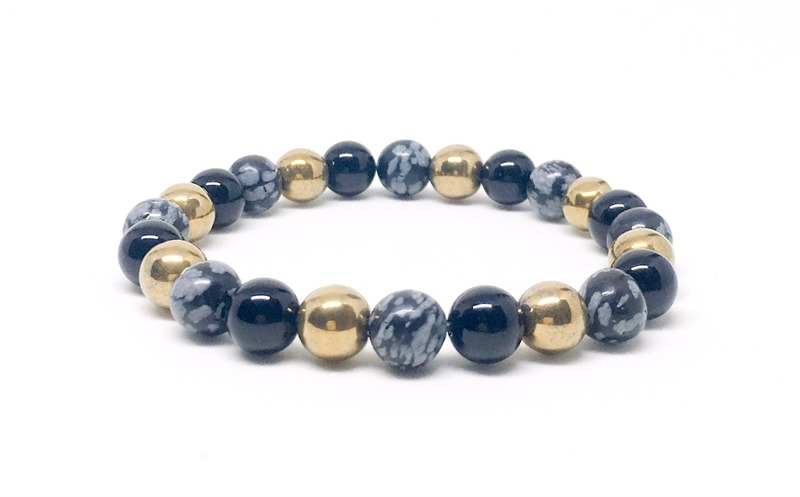 This bracelet is made with beautiful 8mm Snowflake Obsidian, 8mm Gold Hematite and beautiful 8mm Onyx. Snowflake obsidian has the property of bringing things to the surface. The things brought to the surface could be positive or negative, love, anger, secrets; but with snowflake obsidian, these things are brought to the surface more gently that they might be otherwise. Snowflake obsidian can provide balance during times of change. It aids in seeing patterns in life and recreating them in a more beneficial way. It is a stone of serenity and purity, and can shield against negativity. It is associated with the root chakra and is said to be beneficial for the veins, skeleton, and smooth skin. Note that healing crystal meanings are spiritual supports to healing and are not prescriptions or healthcare information. Snowflake obsidian is used for protection from physical and emotional harm. This beautiful bracelet comes in a Sill Suede Pouch customized with our logo.